Door Store and Windows (TDSW) is proud to announce that they are a 2018 Better Business Bureau (BBB) Torch Award winner in the small business category. The BBB Torch Awards recognize businesses and non-profits in small, medium and large categories for their exceptional ethical practices. TDSW takes great pride in their attention to ethical practices. Efforts to be transparent include a clear mission statement, posters and placards featuring their seven core values placed around the showroom, extensive employee screening, and much more. It is important to TDSW to be completely transparent and honest with their customers. TDSW strives to create an outstanding customer experience creating a beautiful, comfortable space using quality products and proven installation techniques. The Louisville community is proud to support TDSW knowing they will always receive the highest quality service and products. TDSW will be recognized as a 2018 Torch Award winner at the 2018 BBB Torch Awards Luncheon on Thursday, November 1, 2018, noon – 2pm at The Olmstead. The first blast of winter is upon us and the chill inside your home tells you your windows or doors need to be replaced. Don’t put it off until better weather arrives. We’ll protect your home from the elements during installation and new windows or doors will make your home comfortable year-round. Planning ahead will keep us from going in and out of the house unnecessarily and limits the amount of time your door or window opening is uncovered. This includes making sure we have adequate plastic for temporary walls (if necessary), plenty of floor protection pads and a thermos of hot coffee! Caulk, foam insulation, and weather barrier membrane are moved to a warm area to keep them ready-to-use. 2. We Protect Your Home From Dirt and Weather. Floor padding protects against dirt, snow, water or construction debris that might be tracked into the house. 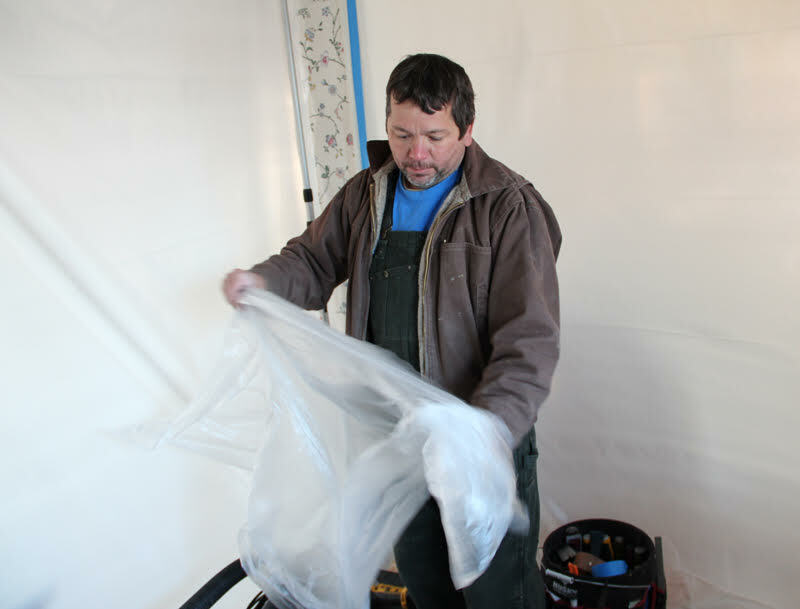 Plastic is hung over nearby openings to reduce the amount of cold air entering the home and to reduce dust transmission. 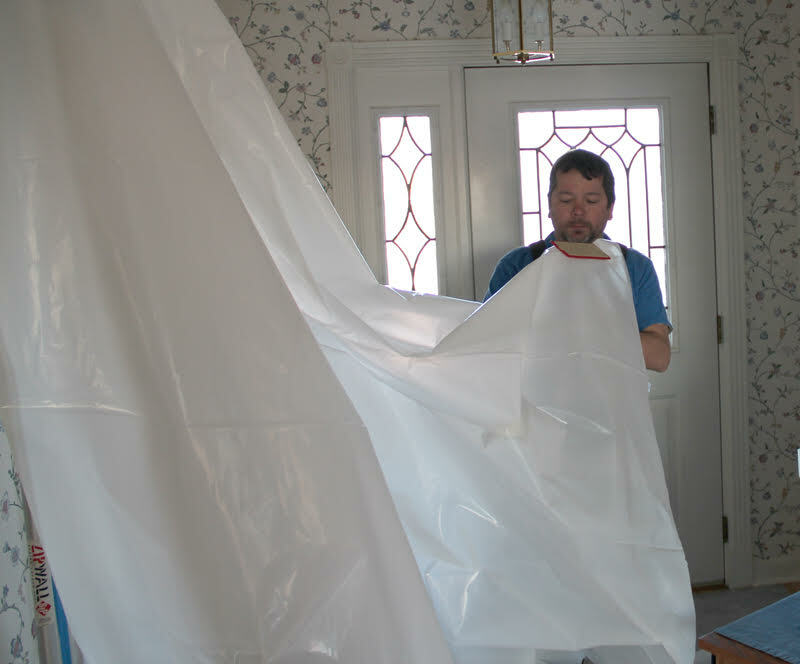 Plastic or padding is placed on any surface or object in the installation area to prevent damage and protect from dust. Delicate hanging items are removed from nearby walls. When possible, temporary weather barriers are created using spring loaded posts and plastic sheeting to close off the installation area from the rest of the house. We also check that all tools and supplies are in place before work begins. 3. We Work On One Opening At A Time. 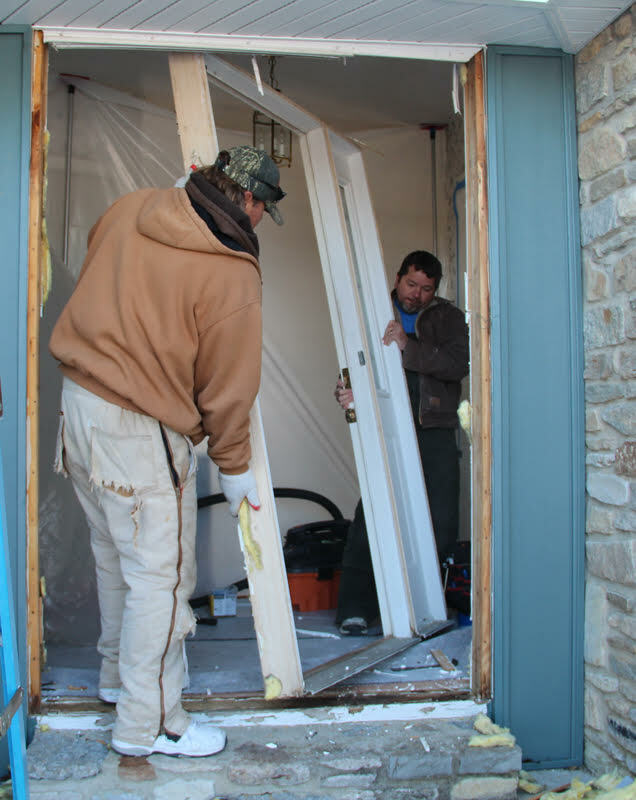 It might be more efficient to do it differently, but in cold or other extreme weather conditions, we work on one opening at a time to reduce the weather exposure inside your home. And we don’t stop working on that opening until it is filled. We don’t stop working on an opening until it is filled…even if it means we work through lunch, darkness or whatever it takes. 4. We Make Sure The New Product Is Ready. New product pre-install preparation, such as the removal of packaging and wrapping materials, is completed prior to the removal of the old product so the new product is ready to install. 5. We Double Check Everything. Prior to removing the old product, we double-check the opening measurements to make sure it will accept the new product. We also check the product against your contract specifications to ensure the right product is being installed. Double-checking keeps us from fully removing the old product only to be surprised if it doesn’t fit. 6. We Remove The Old Product…Quickly! The extra time we spend double-checking the product and opening size usually allows us to quickly remove the old product and immediately begin prepping the opening for the new product. Once the old product is removed, the opening is thoroughly cleared of debris. 7. We Place The New Product…Quickly! The ready-to-install product is placed into the opening and final installation begins. 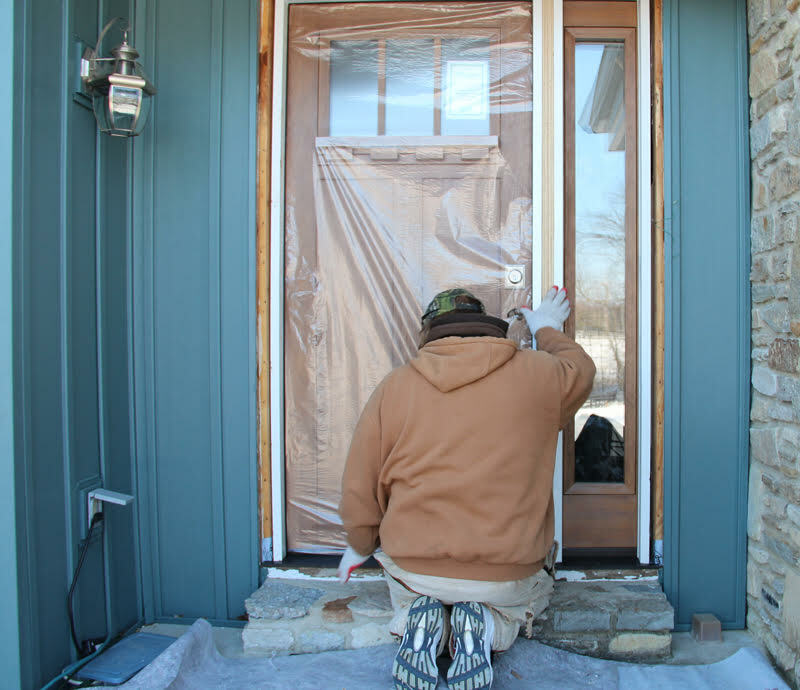 This critical step involves attention to detail to ensure a proper weather barrier is created. The product is leveled, shimmed and fastened. Expanding foam is added in the gaps between the product and the opening to create a lasting weather-tight seal. 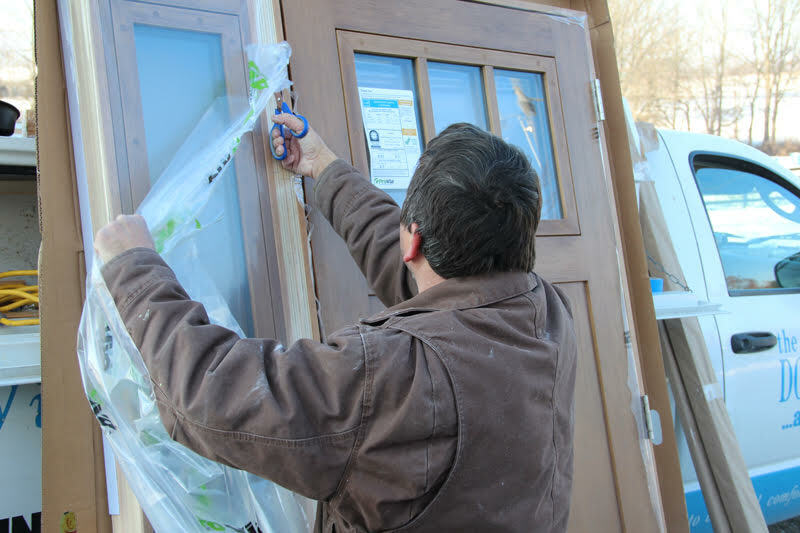 Final installation details such as installing trim and adding hardware is completed and your new window or door is ready to make your home more comfortable. If you’re ready to make your home more comfortable with new windows or doors, give us a call. We’ll ease your fears about cold weather installation and make sure your experience is outstanding.